I would like to identify two types of raster alignment (assuming SRS is the same), but I am unsure of the correct terminology for these (or whether there is even a 'standard')? First, there is 'pixel alignment'; i.e. 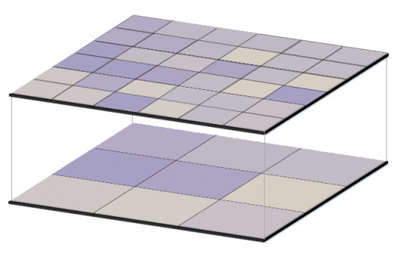 pixels between 2 rasters are of the same resolution and share the same corner coordinate, but the rasters do not necessarily have the same extents. Then, there is 'raster alignment' or origin alignment (or whatever), i.e. where two rasters share the same origin and extents. The common terminology for raster dimensions and alignment are: rows, columns, resolution, extent and origin. For two rasters to be "aligned", all of these conditions need to be met. Besides that, they would need to be in the same Coordinate Reference System (CRS). 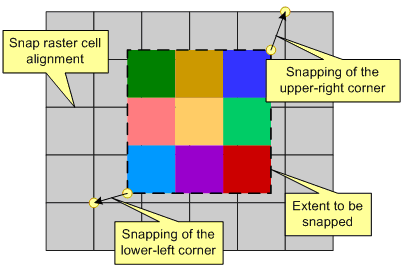 snapping: when there is common resolution (cell size) and different cell’s coordinates. Picture source: Esri, ArcGIS for Desktop. resampling: when there is common origin and different resolutions. projecting (or reprojecting): when there are different coordinate systems. Other common terms are: to 'convert' or 'transform' between coordinates and coordinate systems. Not the answer you're looking for? Browse other questions tagged raster coordinate-system coordinates alignment terminology or ask your own question. What are the methods for calculating area from a raster in QGIS?